Decoding of Pictogram 2nd June 2010 Liddington Castle, nr Swindon, Wiltshire. Decoding of the pictogram Codford St Peter, nr Warminster, Wiltshire. Reported 3rd June. Decoding of this crop circle is very simple. On the pictogram is presented the combined information cell. It consists of two cells – individual consciousness and unified consciousness. Individual information cell is a representation of human being on the information level of the Universe. As we, information cell contains two parts – area of brain and body area. Cells are separated from each other by a cell border. Brain area of an individual cell is a small light circle in the center. Body area is a wide dark ring around the area of brain. Cell borders – is a wide light ring. 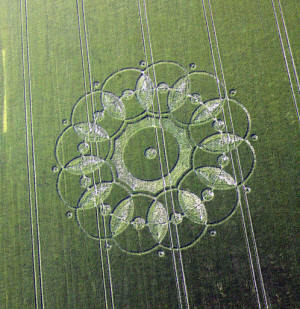 The large ring of crop circle is composed of 12 big circles with small light circles in the center. Each big circle is the symbol of individual cell. Imposition of cells means unification of consciousness. Superimposed on each other, they form a peaked (pointed) oval – symbol of dematerialization and the Transition. Presented principle of consciousness unification ETC use for intergalactic flights in universe to overcome hundreds of millions of light years. United consciousness causes an action. This action transforms body shown by peaked oval – symbol of dematerialization and the Transition. Body transformation is required to transfer to another level of material world for teleportation. So, ETC flight in universe through teleportation on the base of consciousness. ETC use the united consciousness action also for information technology inaccessible to mankind. Even numbers of these cells presents the fundamental law of the united consciousness formation. This law informs: unification of two individual cells, i.e. unification of consciousness of two people, forms united cell with extended area of brain. Number 12 means that 6 pairs of cells are unified. The number 6 indicates a carbon basis of our life. The principle of unification of consciousness is represented by the outer part of the picture by combination of small circles with dots in the middle and big circles. In this case small circles represent individual cells and big circles show the united consciousness cells. Small circles are placed from both sides of each big dark circle. This way the principle of consciousness unification is presented. In this case all internal part of a big circle becomes area of a brain of united consciousness cell. It means transition from individual consciousness to the united consciousness of humanity. It is important to note that this crop circle was created near big circle formation reminding the united consciousness cell.